It’s still in that spot as of this writing, drawing in more viewers than the #2 (League of Legends) and #3 (Fortnite: Battle Royale) games combined. 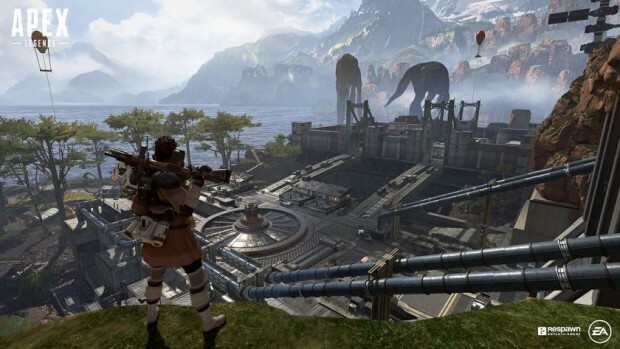 Other numbers you might have heard already: Apex Legends had over a million players in its first eight hours and 2.5 million in its first 24 hours (“trending fast towards 3 million,” Wilson said), with a peak concurrency of 600,000. Another number I like to research when something is brand new: I currently get 14.8 million results when I Google “Apex Legends.” A week ago, that number would have been approximately nil. In his letter to the community, Project Lead Drew McCoy gushed about the game and the team that built it. He promises to be “upfront, transparent, and honest in our communication and support of Apex Legends,” which is just the kind of thing that a game associated with EA, however lightly (“Every creative, design, marketing, and engineering choice within Apex Legends came from us at the studio. Full stop.”), needs right about now. McCoy also gave us some insight into the development time for Apex Legends. He said that the team recognized that battle royale was “not merely a new mode or fad” when the genre broke wide open in 2017 and that the team spent “the last two years” working on the game. That makes for a probable timeline of less than 24 months; PlayerUnknown’s Battlegrounds didn’t show up on Steam until March 2017, and took a few months to really get rolling, while Fortnite: Battle Royale didn’t debut until September. Respawn did have a AAA budget and concepts from Titanfall to work with, so it wasn’t totally starting from scratch, but this helps to illustrate why battle royales, and competitive PvP shooters in general, are so popular with developers these days. They can be built relatively quickly, much more so than even a small MMORPG, and that quick turnaround from concept to finished game ideally leads to money in your pocket as soon as possible. It must make the Anthem guys at EA a little jealous. Speaking of a “finished game,” it’s more than a little refreshing to see Apex Legends simply be thrown out into the wild after no build-up and, importantly, no early access period. For most free-to-play games of this ilk, you’d expect a lengthy early access period, with supporter packs ranging in price from $19.99 to $99.99, despite the game being basically finished and ready for a formal “launch.” While some companies and games are better about this than others, maybe this — and what appears to be generally fair, Overwatch-style loot boxes — is a good sign for the future of the game. It’s almost as if one-size-fits-all marketing isn’t the best approach for a video game! Given its unique situation and the expectations of players — for something akin to Titanfall 3 — the way Respawn decided to do things was probably the perfect choice. Don’t give people the time to poke holes in your game that doesn’t match their preconceived expectations; just put it out there and let it speak for itself. More developers and games should follow suit. I’ll go out on a semi-limb and say that Apex Legends’ fast start isn’t a fluke and that the game is going to do just fine throughout the year and beyond. It could surpass PUBG, which suddenly looks very slow and antiquated, but I’m a little skeptical as to whether it can catch up with Fortnite. That game has such a hold on the mass market right now, with merchandise at major chain stores and a generally “friendlier” look with all its wacky outfits and dances. If Fortnite is Pokemon, Apex Legends is Magic: The Gathering — and that’s not too bad of a spot to be in. The game is really good. And yes its really need solo play. everyone doesn’t like groups. hopefully with an increased player count or a bigger map in a future update that hold 100 players. Game is amazing, needs SOLO play, and not just 3v3. SOOOO GOOOOOOOOOOOOOOOOOD. Best quality game for free, AAA game for free. 2019 is gonna be a good year for gaming! Here’s a shocking revelation? Don’t like it? Don’t play it.